The inherent properties of the water that flows out of the tap rarely make it suitable for use in commercial processes in trade and industry, the food & drink industry, the pharmaceutical industry, hospitals and for public drinking water supply. For over 40 years, BWT has been designing and implementing advanced, standardised products and specific, tailor-made solutions for these applications, taking account of all the relevant ecological and economic factors. Raw water needs to be optimised for the specific requirements of the catering industry (HORECA). BWT bestmax provides you with a universal filter system that fulfils this task simply and efficiently. The filter system consists of a filter cartridge with five filter levels and a BWT besthead filter head that is screwed on. The blend partial flow (0–3) is set on the filter head depending on the water hardness and requirement. Check valves in the filter head prevent the water from flowing back into the drinking water mains or filter cartridge and protect against uncontrolled water discharge. BWT bestmax food-safe filter systems are pressure-resistant and safe. They can be used worldwide in any drinking water system. BWT Bestmax PREMIUM is a filter system with which you can refine raw water to produce gourmet water that is outstandingly suited to making hot beverages such as coffee, espresso and tea. The modular multi-stage filter uses patented BWT Magnesium Technology, which also mineralises the filtrate with magnesium. This flavour carrier guarantees high sensory quality in both the water and the products made from it. The filter system consists of a filter cartridge with a BWT besthead filter head that is screwed on. The blend partial flow (0–3) is set on the filter head depending on the water hardness and requirement. Check valves in the filter head prevent backflow and uncontrolled water discharge. 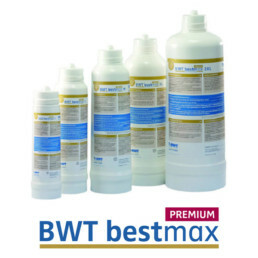 BWT bestmax PREMIUM food-safe filter systems are pressure resistant and safe. They can be used worldwide in any drinking water system. Perfect coffee water from every water type – that’s the BWT water+more promise. 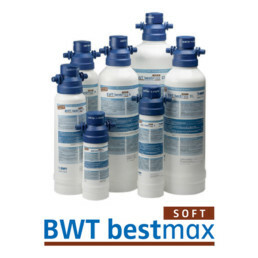 Joining our world-beating hot drinks range of filters, BWT bestmax SOFT targets raw water with low carbonate hardness. Providing taste and odour filtration, pH maintenance and pinpoint scale management, BWT bestmax SOFT offers coffee shops in ‘soft’ water areas good machine protection and great hot drink quality. Using successful HET technology, BWT bestmax SOFT provides maximum efficiency and high treatment capacity in multiple sizes. The latest bypass technology and the same connecting head means switching to BWT bestmax SOFT is a very low cost option for existing installations. Applications: For optimising already soft water. 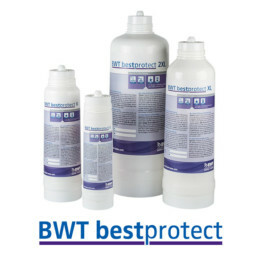 With BWT bestprotect, you can optimise raw water for catering applications in a targeted way. This filter system ensures balanced mineralisation and a consistently high pH value in the filtrate – key factors that minimise the risk of corrosion. Hardness-forming calcium ions are practically entirely removed and deposits of limescale and gypsum prevented in the case of raw water containing carbonates or sulphates. Insoluble or difficult-to-remove deposits in machines are now a thing of the past. The filter system consists of a filter cartridge with a BWT besthead filter head. Check valves in the filter head prevent water backflow and uncontrolled water discharge. BWT bestprotect food-safe filter systems are pressure-resistant and safe. They can be used worldwide in any drinking water system. Applications: For protecting catering and vending equipment. 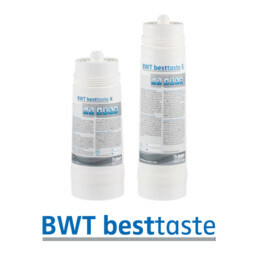 BWT besttaste is a water treatment system for the elimination of particles and chlorine from, and the improvement of the odour and taste of, drinking water. besttaste improves the quality of the water for use in coffee machines as well as in hot and cold drink machines. Applications: Drinking water, coffee and vending. Today’s customer has high expectations. They value quality, service and perfection, including the detail. Restaurateurs who take these demands seriously have an innovative tool available to them rinsing technology in the filter system BWT bestclear. Through its special design, BWT bestclear ensures that nothing can dry on crockery, glasses or cutlery during the rinsing process. The result is conclusive: spotless place settings, brilliantly shining glasses and sparkling cutlery, making the table ambiance perfect for the customer. 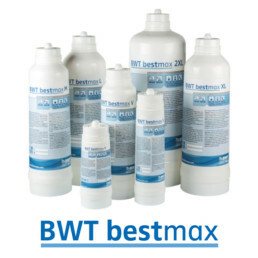 BWT bestmin PREMIUM is a filter system especially for the mineralisation of low-salt water. It is ideal for use downstream of reverse osmosis systems and for producing hot beverages of all kinds for coffee and vending machines. A sufficiently high mineral content in the water is important for the best possible coffee taste. Otherwise, the taste is often flat, even at high coffee doses. In addition, the coffee powder can swell up too much, causing a negative impact on the brewing process. 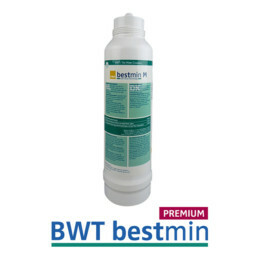 BWT bestmin PREMIUM filter cartridges bring the mineral content back into balance.In particular, they increase the content of the key flavour carrier magnesium. 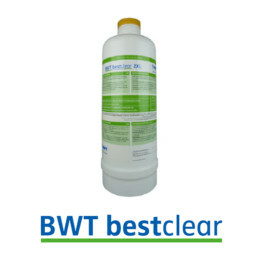 BWT bestdrink PREMIUM also reliably removes unwanted ingredients such as particles, organic components and chlorine. The filter system consists of a filter cartridge with a BWT besthead filter head screwed onto it. Check valves in the filter head prevent return flow and uncontrolled water escape. Foodsafe BWT bestmin PREMIUM filter systems are pressure-resistant and safe. They can be operated worldwide in any drinking water system and with any coffee or vending machine. Applications: For perfect mineralisation in coffee and vending equipment. A programmable aqaumeter ensures that you get the maximum capacity out of your water filter and helps you change it when its due. After completing a water test you will know the capacity of your cartridge in litres, program this in the compact and remote digital display and it will count down as you use water. 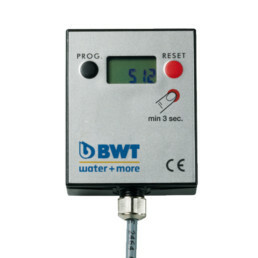 The meter, when connected to the head, provides an accurate measurement of the amount of water used. After connecting the meter, you have to program it according to the capacity of the filter – the readings of the meter will be displayed until it is reset. The device is powered by CR2032 battery. Applications: For use with BWT water filters.